Fishing Tips for Beginners: Fishing as a hobby or fishing as a pro could get really exciting if you know how to fish. It is one of the most passionate outdoor activities that you can enjoy with family, friends, or even self. By following out Fishing Tips for Beginners, you can shorten your learning curve. Follow this Fishing Tips for Beginners guide to know more. 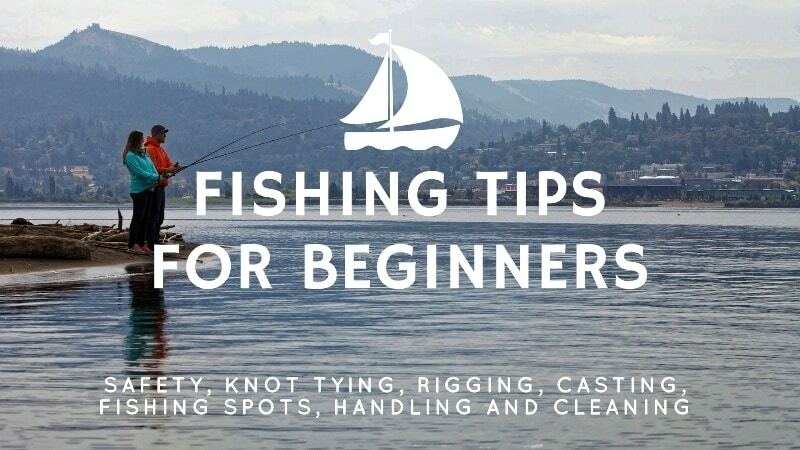 Fishing Tips for Beginners is the second part of our Learn to Fish mini-series. You may check out the first part here at Fishing Basics for Beginners (Learn to Fish: Part 1). Before you begin this fishing tips for beginners guide, you must know that safety is the top priority! Here are a few things that will come handy for you while pursuing your fishing passion. Personal Floatation Device: Carry a life vest or a personal floatation device if you are planning to sail in deep waters for fishing. Suntan lotion: Use a suntan lotion to avoid harm due to sun rays on a sunny day. Other protective gear: Carry important stuff like an insect repellant, sunglass, a fishing rain suit and a hat before you sail. Map: Always carry a map, guide, flashlight, and a radio with you in case of emergency. Clothing: Wear appropriate clothing including gloves and waders for fishing. Sling pack: Carry a fishing sling bag to keep your fishing tackle within easy reach. Avoid fishing in non-permitted areas; there are possibilities or other harmful water creatures waiting to have a feast on you. Avoid getting distracted while you are fishing. E.g. taking pictures, or updating your social channels. Handle the fish that you have caught carefully. Read this fishing Fishing Tips for Beginners guide completely before you start. Knot tying is an art in fishing. You must ensure that your fishing knot is tight as a weak knot may result in you losing your fish. Generally, you must pass the fishing line through the eye of the hook and pull it tight. Ensure that you do not overlap knots as there are possibilities of wear and tear of the knot. You should wet the line before tying a knot; it is easier to slide the line and tie a knot when it is wet. Once you have tied the knot, you must pull to check the strength and confirm that you are all set for fishing. You may be aware of different types of knots. But over here, we will only discuss those which are easier for beginners. Palomar Knot: Most fishermen consider Palomar to be one of the strongest knots for fishing. If you learn to tie it properly, you can easily secure your hook by tying one end from your fishing line and other to the leader with a slight swivel. Clinch Knot: By practicing for a week, you will learn the clinch knot easily. A clinch knot is firm and strong; thus it can carry big fish smoothly. Spider Hitch Knot: If you learn to form a double line to make a spider hitch knot, this could really turn out strong to catch your prey and hold the leaders. Blood Knot: Blood knot is not used regularly by beginner fishermen. But, it is an easy to use knot for catching smaller preys. It may not be as fascinating as other knots for holding hooks but it is quite effective. Surgeon’s Knot: Surgeon’s knot is useful when you are intending to attach more than one piece of fishing line. It helps when you are using two fishing lines, may be of different diameters, at the same time. Rigging is the method to assemble all the fishing tackle before you begin casting and can be performed in different styles. But the main purpose is to tie together hook, swivel, bobber, sinker, and bait etc. to the fishing line. Some rigging techniques are named as per their purposes. Once you have learned the basic fishing techniques, you would realize that most rigging methods are not complex. Here we will discuss some rigging techniques which are easy to use, especially for beginners. Bobber Rig: Bobber rig is often referred to as the most basic rig. This technique involves attaching a boober on your fishing line. Bobber lets you realize when the fish is eating your lure. Such a technique is ideal for catching small fish. It is the preferred rigging technique for beginners. Bottom Rig: Also known as the standard rig, the bottom rig is also easy to use rigging technique. As the name suggests, you can perform this rigging method to catch fish at the bottom of the water body. It involves tieing live bait and hook together and sinking them to the bottom. The bottom rigging technique is useful for catching catfish, redfish, flounder and more. Popping Cork Rig: Popping corks are easily available at the retail stores. In this rigging technique, you need a stiff wire attached to the cork float with few plastic beads. It is easy to assemble and can be followed by beginners to catch smaller fish. Casting is an act of catching the fish by using a fishing rod, fishing line, and hook. There are different casting techniques that work well with different types of fishing rods. Fishermen use various casting techniques to lure and catch their prey. We will discuss some casting tips for beginners to get started. Before you begin casting, the beginners should understand body position, hand action, and arm action. Next, point your feet toward the target care and keep your shoulders square. This is the desired body position for casting. Arm action needs to be similar to throwing the darts. When you are casting for the first time, you should tie on a casting plug without fishing hooks. Another safety tip is to check your immediate area and ensure there is sufficient distance from other casters. Spinning is the preferred form of casting for beginners. Spinning rods are easier to use as compared to most other fishing rods. But you need to practice the timing of releasing the fishing line with your finger. If you release the line too late, then the plug will land close in front of you. If you release the line too soon, then the plug is more likely to go straight up or land up behind you. Go for shorelines. Most fishes travel to the shoreline in search of food. Shoreline waters are weedy and shallow which makes it easy to lure the fish. Look for stagnant water bodies like lakes and ponds. Many smaller species of fish prefer to stay in clean and moving waters. Streams and rivers are ideal places for beginners. You will find more fish in warm water. This is one of the reasons why most fishermen prefer to go fishing in the afternoon. When the water gets warmer, more fish are available to catch. Use online maps to search for water bodies in your area. Dark colored water bodies are preferred the most as good number of fish wander here. Color shading also indicates the depth of water. Learn about rocks, grass, wood, and plants in the area where you will be fishing. It also helps a lot to know what kinds of fish you are going to attract. Different fish species live in different types of water. You should spend some time to learn about various factors which determine fish habitats. You should understand different factors such as such oxygen, depth, climate, temperature, salinity, and water current. For instance, tuna live in saline waters whereas bass lives in both freshwater and salt water. Here we will discuss some common indications which can help you detect when the fish is biting. As a beginner, you should first learn and understand the normal movements of your lure or bait. So that when your lure vibrates or moves in an unusual manner, you would know that the fish has caught the bait. When you feel an unusual movement in your lure, don’t react or jerk immediately. Water bodies have other creatures (and water currents) so you need to be sure that it is actually a fish that has caught your lure. Wait patiently and watch the movements of your bait. Hopefully, you will feel the fish making some movements on the bait. Another useful tip is to observe others who are fishing there with you. Don’t miss to learn from the experiences of others when they caught their first fish. Slowly, you will also learn to detect when the fish is biting the bait. In order to retrieve a fish, you must practice handling your rod, reel, and line. Sometimes, multiple fishes are caught in the lure and thus you may need to release some line for others to get free from the bait. Always wet your hands before holding the fish else you will remove the natural slime after catching the fish with your hand. In case you are intending to release the fish back in the water, avoid putting them in your well. Put them back in the same water from where you caught it or the fish will get stressed due to change in water type. Fish cleaning is an important skill. If you are planning to eat the fish that you catch, you will need to keep it clean and fresh. Pour the same water from the water body in your cooler or stringer where you will store the fish after catching. You should use a shallow blade to scale the fish or you may end up tearing the intestines. Remember, you must remove the head before opening the belly. Remove the head and then open the belly to remove all the remaining innards. Once you have scaled the fish, rinse it under a good flow of tap water and wash the skin properly. After cleaning the fish, you may prepare steaks or fillets immediately or store the fish to cook later. While filleting, it is very important that you take off the fins. Remember, you must always cut in the direction away from you. We hope this Fishing Tips for Beginners guide will help you pursue your interest in fishing. But, reading can only take you so far. Fishing is an outdoor experience that will teach you much more about fishing in real. If you are interested in fishing, don’t wait any longer to cherish this amazing passion. Get set and go fishing! Don’t forget to share your experiences of first time fishing with us through comments. Fishing Tips for Beginners is the second part of our ‘Learn to Fish’ two-part series. You may check out the first part here at Fishing Basics for Beginners (Learn to Fish: Part 1).